It's Card Making Show And Tell! Got some DIY invitations or invitation ideas to share? Or maybe you have some great paper crafting tips you'd like to share. Submit your tutorials to help inspire others to make invitations, or submit an article about your latest and greatest paper crafting projects. It's cardmaking show and tell! Help inspire others with your amazing handi-work! We accept only original content so if you have submitted your works to another site please re-write your article or tutorial before submitting it here. All articles must be related to making handmade invitations or cardmaking. Any article unrelated to the websites content will not be published. Please do not submit "advertisement only" articles or tutorials. Submitting photos and graphics with your articles is recommended. If you have more than one picture to display simply add the URL of your picture with the image tags. Otherwise respond to our email with your pictures attached and will get back to your shortly. Did you make a great handmade invitation that you'd like to share with our readers? Submit a photo of your work along with a little bit about how you created it to the form below. Make sure and include as much info as possible. Need some ideas as to what to write about your invitations? Describe your handmade creation with a title. For example "snowflake wedding invitations" or "First Birthday Invitations"
What kind of materials did you use? Is there a specific kind of paper you used? A cool paper punch or rubber stamp? A certain glue that worked wonders for you? Describe the steps you took to pull it all together. How long did it take? Was it easy to do? Add your own tips, ideas, or opinions. Add you own flare to it. What was the reaction you got when you showed your creation to others? Any tips you'd like to share? Great places to shop for materials online or elsewhere? We'd love to see photos of your work to add to the tutorial. You can enter 1 image within our form although if you have more than 1 to contribute (highly encouraged), you can enter the URL of the photo's if they are hosted on Flickr or Photobucket, or anywhere else on the web. If you'd like for us to host the photos for you just let us know and we'll be happy to add them for you. Add your own page to our website! By filling in the forms below you can upload a picture of your very own handmade creations as well as a tutorial or a few words about how you made them. Try to be specific. 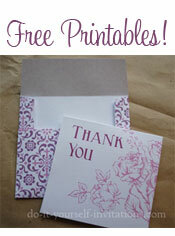 Our readers love to know not only how you made your invites, but what products you like to use as well. Your story will appear on a Web page exactly the way you enter it here. You can wrap a word in square brackets to make it appear bold. For example [my story] would show as my story on the Web page containing your story. You can also add pictures by using an image tag like this: - you can get the image URL by right clicking on your image on a web page like Flickr or Photobucket, and then select "copy image location" then place the cursor on the screen and hold down the control button and hit the letter "V" to paste the URL into the image tag. Done sharing your DIY invitations? How about a trip back to our homepage?